He’s the seventh son of a seventh son. She's the daughter of a wise woman. They're both trying to avoid their fates. Diarmuid is not a typical bard. His tales aren't about hope and heroism, but instead they reflect the darkness he feels inside. When he inadvertently brings his imaginary muse to life, everything she knows comes from Diarmuid’s melancholic tales. Desiring her own life, she leaves Diarmuid and sets out to live in the only way she knows how. Brigit tries to be a good wise woman like her mother, but feels like she’s wasting her life dispensing charms and cures. She spends her days longing for danger and adventure. 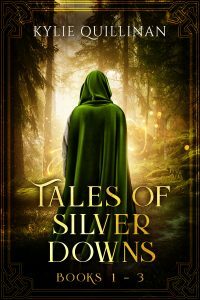 When she encounters a fey and becomes the victim of a cruel curse, she gets more adventure than she ever wanted. 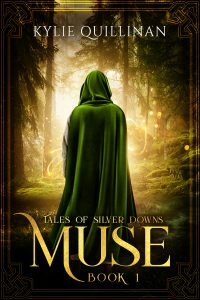 Muse is the first book in a series of Celtic-inspired historical fantasy novels. 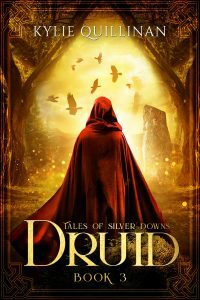 If you like lush historical backdrops, complex characters, and new spins on Celtic mythology, then you’ll love Kylie Quillinan’s engaging series starter. Pick up a copy of Muse to begin the unforgettable journey today! A SEVENNIGHT BEFORE my brother Caedmon was handfasted, we gathered at his bride's family estate, Misty Valley. Their modest stone lodge brimmed with friends and family. Ale flowed freely and folk danced to the raucous tunes of fiddler and whistler. Winter garments — hats, coats, scarves — were piled on a bench in the corner, abandoned in the warmth of ale and dancing. I ate and drank, avoided solicitations to dance, and tried to pretend I was happy for Caedmon. My muse, Ida, whispered snide remarks about people around us. One subject of her scorn was a man whose nose was so long and sharp, Ida wondered whether he could slice bread with it. Another was the woman whose fat fingers could hardly bend to lift her mug. Had I the courage to voice such thoughts, surely the revelry would dissipate and we could all go home. Every bard has a muse and Ida was as real as any man's, to me at least. Her image, in my mind's eye, was as clear as if she stood beside me. Blonde of hair, blue of eye, skin so pale it was almost translucent. Folk around these parts were dark-haired with milky white skin. Ida looked like no one I had ever seen. It helped me remember she didn't really exist. As folk tired of dancing, we gathered in front of the grey stone fireplace at one end of the room. The sweet scent of pinecones on the fire filled the air, covering the lingering smells of roast meat and bread. The older folk warmed their bones on comfortable chairs drawn close to the flames. Small children perched on their laps or on brightly-coloured rugs at their feet. Those who were neither old nor young enough to claim a position close by the fire gathered behind. Some sat on wooden benches, others leaned against the walls. I found a spot on a bench towards the back of the room. My belly was comfortably full and now that all the merriment had subsided, I eagerly anticipated the evening's tale-telling. Tonight I would make Ida proud. Caedmon and his betrothed, Grainne, sat near the front, he with an arm around her shoulders. Both were flushed and bright-eyed, still catching their breath from the last dance. Grainne's father, Laeg, stood beside the fireplace. He was a hardy-looking man, plump and rosy-cheeked. Grainne and her three sisters all looked much like him. "This seems a fine time for a tale," Laeg announced and the crowd swiftly quietened. "Caedmon, my boy, I believe you have a bard in the family. Is he here tonight?" "Yes, my lord." Caedmon darted a glance at me over his shoulder, a warning in his eyes. "My youngest brother, Diarmuid, back there, is the bard." Laeg nodded in my direction, although the way his eyes searched the crowd showed he didn't know my face. "Well then, young Diarmuid, will you favour us with a tale?" My heart pounded as I made my way to the fireplace. Laeg slapped me on the back and then stepped away to lean against a wall. I cleared my throat. "This is a new tale," I said. Although my voice was loud and confident, my breath quickened, for in this moment before I began, I suffered from nerves. While the tale was still unspoken, it was perfect but it would become imperfect in its telling. For a tale told never quite lived up to the promise of a tale untold. Once the words began to flow, calmness would wash over me, although I could never entirely lose myself in the tale. I was always acutely aware of every murmur and movement. Flames crackled in the fireplace and occasionally a seat creaked. Children were swiftly hushed as I told a tale of a woman who had offended Titania, queen of the fey. The woman had a babe who was not yet four summers old. As punishment for the offence, Titania ordered the woman to take her child into the woods. "The woman cried and begged and offered her own life in exchange for that of the child. But Titania ignored her pleas, for the fey do not feel as we do and do not understand fear or sadness or pity." By now, the mood in the room had changed. The seats creaked more often and children were not shushed quite as quickly. Discomfited, my words came a little faster. "So the woman took her child by the hand and led her into the woods. As they made their way through the trees, the woman swallowed her sobs and did not allow her tears to fall, for she did not want the child to be afraid. 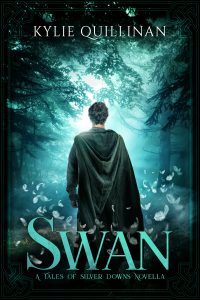 "At length they reached a clearing and as they stood in the centre, the woman knew she could not leave her child there, regardless of Titania's instructions. She resolved to keep walking, all the way through the woods. Eventually they would reach the other side. They would continue to walk until they found a town where the people did not know of the fey. But as she left the clearing, Titania suddenly appeared in front of her. 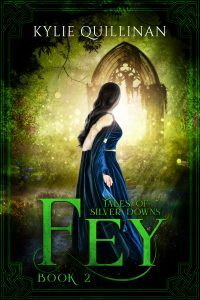 "The woman fell to her knees before the fey queen and again begged for her child's life. But she could not sway Titania. "Eventually, with many tears and much sorrow, the woman kissed her child goodbye. 'Be brave, my sweet,' she whispered and released the child's hand. Sobbing now, the mother stepped back into the trees for she intended to stay to witness her child's fate. On the other side of the clearing, Titania also waited. "Only moments passed before two wild boar entered the clearing. They sniffed the air and scented the child. The child tried to run from the enormous black beasts but Titania charmed her and she could not move her feet. "The boars circled the child, once, twice. Then they lunged. Blood sprayed onto the leaves as they ripped the child's limbs from her body, first her arms, then when she fell down, her legs. The child did not stop screaming until they tore off her head. The mother sobbed but she did not cover her ears for she wanted to hear every moment of her child's death. She knew she would hear her daughter's screams echoing in her memory for the rest of her life. "The boars devoured the child and even licked up her blood from the leaves. When there was nothing left, they turned and went back into the woods. "It was only then that Titania spoke again. 'Your lesson is concluded,' she said. 'See that you have learned it well.' Then she disappeared into the woods and did not return again." As I finished speaking, one of Grainne's relatives left, taking two small children with her. I had intended to demonstrate how the fey interfere in human lives at their own whim and that they care not for what misery they bestow. That sometimes fate or circumstance, or the fickle desire of the fey, cuts the closest of bonds and that not all tales end happily. I waited, shifting from foot to foot, heart pounding, for my audience's reaction. My words hung heavy in the air and folk avoided my eyes. As always. A child began to sob. "I don't like that story, Papa," she said. There was no point waiting for Laeg to construct some suitably polite words. As I left the room, someone finally comforted the crying child.